It is great to be in Arizona with good friends and neighbours. 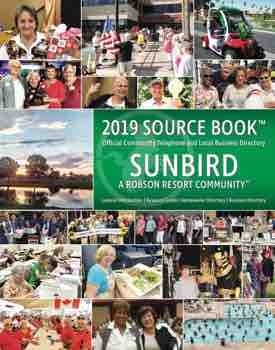 SunBird provides us with never-ending opportunities to participate in every conceivable social activity. Specific to Canadians are the February BBQ, the March Golf Tournament and the Conley Cup. Our Pork Loin BBQ and social is on Thursday, February 7. This event costs $7.00 per plate and will be held on the patio from 3:00 to 6:00 p.m. (BYOB). The theme this year is Trivia Night in small town Canada. To register, email Mike McMillan at msmcmillan@rogers.com. Details are on our poster and flyers in the clubhouse. The Great Canadian Golf Tournament tees off on Sunday, March 17. Registration will take place at the BBQ. The cost is $40 per person which includes golf and a pizza dinner in the ballroom. This tournament is a social scramble for Canadian golfers of all levels of experience. Come and join us. The Conley Cup, our annual Can-Am golf competition between our best players from each country (living in SunBird that is), is slated for late March. Once again, we are recruiting young guns (under 70 that is) from all over Canada. With cheers from the Canadian galleries, our team pulled off a resounding victory in 2018 under the leadership of Team Captain Ron Jarvis. Let’s make 2019 another win for the True North.